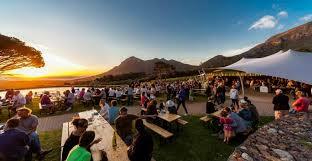 A round-up of some of the best markets in the Cape winelands. Families are welcome! Expect arts, crafts, food and a chance to pet the farm animals. Buy something to eat and drink (no BYO) and relax on the lawns with a picnic blanket while listening to live music. Expect artisan foods, arts and crafts, home ware and décor, live entertainment and lots of fun activities for kids. The Groote Post Rosé is made exclusively for the farm’s monthly market visitors. One of the winelands’ newer markets, launched in October 2014. Fill your basket with local produce and bespoke crafts, buy a picnic and let the kids to enjoy the lawns. Find fresh regional produce and home-made fare, ranging from oysters, pies and gourmet delicacies to decadent sweet treats, as well as crafted gifts. But the highlight is the polo game that coincides with every market day. On the lawns overlooking the dam and vineyards, you’ll discover scrumptious food from the likes of The Food Barn, Kitchen Cowboys and Cooked at this small but vibrant market. Held in the town’s main road, this small but authentic market has been going strong for 14 years. Food is the focus – the olives in particular are worth the effort. A sprawling market with loads on offer, all in Downing marquees so the weather is never an issue. Plenty of food vendors, as well as homeware, clothing and craft traders. Live music too. Founded as part of the Slow Food movement. An especially wide range of food stalls with scrummy goodies to take home and eat there. Clothing, jewelry and crafts, too. Bedouin tents are erected when it rains, but things can become a little crowded. Organic veggies and meats and a host of other farm-fresh items, include eggs and olive oils to fill your grocery basket. Emma Odendaal was deputy editor of Wine magazine and managing editor of Getaway and is now doing cool stuff at Fresh Living. She contributes to various food and travel publications.